Using defensive driving tips and skills will help any motorist whether driving a truck or passenger car prevent incidents or accidents while operative a vehicle. Makes a safer journey whether short or long whether on a commute to work, or while taking your child to school, or your ride around the block to the grocery store. Defensive driving starts when your car starts. Defensive driving begins with the way that you think. Defensive driving by definition is simply driving in a way that takes in to account the potential inadequate driving abilities of others. Some driver's license offices offer defensive driving courses that teach you text book techniques (and definitions) plus you will get points taken off your license and a reduction in insurance premiums in some states. There are many third party schools that teach Defensive driving also. Some community colleges also offer Defensive Driving Course. You can search to see if there defensive driving course training in your area. . . .
Basically defensive driving is no more than applying a proactive thought process and responsibility to the art of driving. There are things that you should do before even getting behind the wheel to help you be a safe, well prepared driver. Visually inspect your vehicle - As you are walking up to your vehicle (first check your surroundings) be looking underneath the front of you car to see if there are any fluid leaks. Start your car, turn on the lights and put on your left blinker. Listen for unusual sounds as you do a quick walk around look at the tires for cuts, cracks and excessive wear. (As soon as you get time get a tire pressure gauge and inflate your tires to the recommended psi stated in your handbook)See if your tires have the right amount of air. Also look to see if your turning lamps are blinking and headlight burning. Then go in your car and put on the right blinker. Make sure the lamps are working outside the car. Once a week you should be doing a more thorough inspection where you follow a check list that is probably in your handbook which should include checking the tire pressure, oil, windshield washer fluid, antifreeze, transmission fluid,power steering brake fluid and windshield wiper blades. Check your belts for cracks, dry rotting and shredding threads. 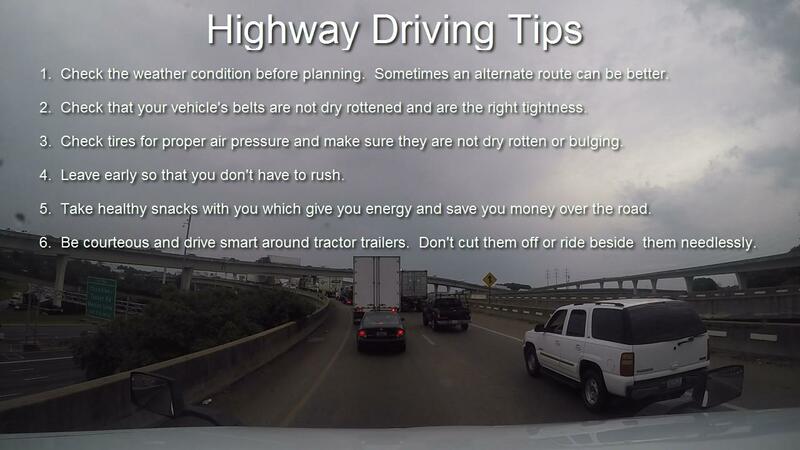 If any of these things are not in proper working conditions if could keep you from being able to drive defensively. Use your turn signal - I don't know if people think these things are for cosmetic effects or what. Truth is they are a very useful tool to let all us of know what your plans are. Every time you intend to make a turn or switch lanes you are suppose to flip that lever to let us know before you are in the process of making the lane change or have to brake to make the turn. If you wait until you are breaking we already know! Keep safe following distances from the traffic in front of you at all speeds. The faster your traveling the more distance you should have. The more severe the weather the more you should increase the distance. Keep a cushion of space on all sides of you when possible. Think of all the people with the me me me me attitudes. Think of all the people who are not like you. They don't care about being the best drivers they can. They will cut you off, try to manipulate your behavior by tailgating you, and even do just unnecessary and ridiculous things on the highway. You don't know who these people are but you don't want to be around that kind of driver. They have an increased change of causing or being involved in an accident. Stay our of clusters of cars or truck riding together. Pay attention to your environment so that you might identify a potential hazard before you are in the middle of people reaction to it. Look far ahead, to both sides and check your review mirror often. If you see an object up ahead in the right lane (your in the middle lane) before you get to it you know not to be anywhere beside a vehicle in the right lane because that fool might not look ahead and see it,at the last minute he might swerve at the last minute into your lane. This is also an example of why you don't ride beside people casually. That object could be a pot hole, an animal running out from the woods, on and on. Thousands of reasons not to ride beside each other. Do not ride middle lane going less than the posted speed limit. Some of you were told to ride in the middle its the safest lane they say. Those people should be fired. That is the me, me, me, attitude in full effect. You are so concerned about you that you are putting your self in danger which makes what you call yourself doing (being safe for you) null and void. It's counter productive. You are not being safe ridding in the middle lane doing the speed limit or under. Especially if you are the only one on the highway going the speed limit. Be courteous to other drivers on the road. Don't act like you are the only one that matters, sometimes people seem to intentionally cause other drivers an inconvenience. They ride the middle and even the left lanes just because. Is that you? That's just called being courteous. What does it take from you? Try going 55 mph around Atlanta Ga on the I-285 loop in the middle lane. You will cause serious problems. Summary don't fight the flow of traffic for the sake of malicious obedience or a false sense hood of being safe. Do the speed limit from the right lane if everyone else is zooming by you, cause you are making traffic ride beside all of us who are in the right lane. Do not ride beside or close behind big trucks Either pass or fall back to a safe following distance. Can you see in front of us when you are tailgating us? The answer is no. So does that mean if some fool cuts in front of us just to slam on the brakes to make a right turn you won't know about it until you see our brake lights? If you rear end that truck you are not gonna push it. It will be like you hit tree (almost). Why shouldn't you ride beside a big truck? You shouldn't ride beside any vehicle without a reason. I don't see what sense that makes but . . . Especially Not A Big Truck Because . . .
One. If something happens to a driver of a car your riding beside (heart attack, sneeze, fall asleep, they don't see you and change lanes,etc) you have a chance to not even be moved by that car right? If the same thing happened while riding beside a tractor trailer there is a good chance that you will not fare well is that true? Second. Fact, we have blindspots on the side of the trailer where if you ride at the same speed that we are going we won't even see you. Big truck tires are under a lot more pressure than car tires. If one blows off with you riding beside it, it could damage your car or shatter your window and smack you in the face. Things can go wrong very quickly on the highway. They can be unpredictable and until you are in an accident, you really can't understand just how quickly, so take my word for it. It takes a split second and a combination of things to occur at once and life changing or life ending disaster can strike. For your safety, these driving tips should be taken seriously.